There is a whole world out there - experience it with Cruise1st Land Tours. Ready to set sail on an incredible cruise holiday? Combine your cruise with one of our guided land tours for even more fun. From sightseeing to experience tours, we have everything you need to make your holiday perfect in destinations across the world. Browse our current selection below or read more about our cruise and tour packages destinations. Take a look at our 4 top escorted tours! Overnights in Shanghai, Hong Kong, Bangkok & Dubai! 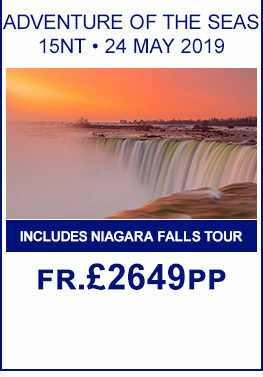 , Includes 7nt Walls and Warriors Tour! Includes Singapore City Hotel Stay! 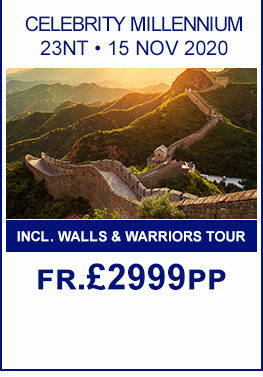 , Incredible Terracotta Warriors, Great Wall & Beijing Tour , Newly Reduced Prices! Save £1485 Per Couple , £0pp Deposit! Includes Hotel Stay in Hong Kong , £0pp Deposit! , Upgrade to Oceanview from £99pp , Includes 8nt Walls & Warriors Plus Chengdu Pandas Tour! 16nt - Spectrum of The Seas with Walls & Warriors! Includes an Overnight in Hobart, Tasmania! , Includes 5 Day New South Wales Escorted Tour! Free All Inclusive Oceanview & Above! 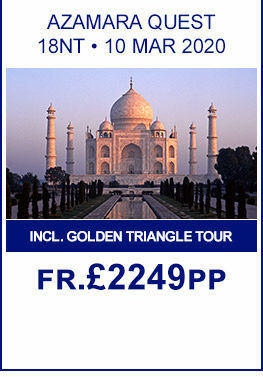 Includes Indian Golden Triangle , Overnights in Mumbai and The Maldives! 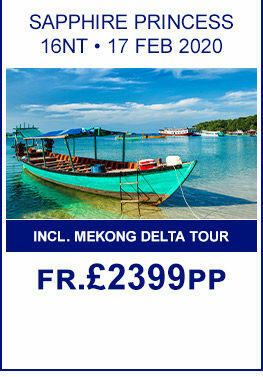 Upgrade to Balcony Stateroom from £299pp , Includes Highlights of Sri Lanka Tour! Bucket List Rail, Sail & Rodeo from Cruise1st! , Rocky Mountaineer Goldleaf & Alaskan Cruise! Bucket List Rail, Sail & Rodeo from Cruise1st! , Rocky Mountaineer Silverleaf & Alaskan Cruise! , Goldleaf Upgrades starting fr £499pp! Rocky Mountaineer Silverleaf & Alaskan Cruise! Rockies Rail, Banff NP Tour & Heli Flight! , Upgrade to Goldleaf Service From only £299pp! , Free upgrade to Balcony! Includes Cape Town and Garden Route Tour! Cruise1st have established relationships with some of the world’s best tour providers. Working across the globe, our tours have been tried and tested to ensure they offer the greatest experiences at the best value with no hassle. Wherever you’re going, we can offer you a range of tours that make the most sought after attractions completely accessible. Our North American tours show you the bright lights of the USA’s finest cities as well as the stunning mountains of Canada. If you’re cruising to South America, we offer tours everywhere from Brazil to the southernmost tip of Argentina. And in South Africa, our tours make it easy to catch a glimpse of the best safari animals and most incredible wildlife. It doesn’t end there. Let your senses run wild on our tours across the Far East and China with bustling markets, ancient temples and out-of-this-world cuisine. Explore the cultural wonderland of India and the sub-continent. And dive into the action down under with our tours of Australia and New Zealand’s modern cities, endless beaches and vast landscapes. Find out more about our tour destinations or find a cruise that is right for you above. Remember if there is a tour or experience you have in mind but can't find on our website, please call our experienced experts as we have 1000s of tours available! Canada and the United States are two of the most exciting countries in the world. When it comes to mountains, you simply can’t beat the Canadian Rockies. And one of the best ways to explore them has to be by rail. The luxury Rocky Mountaineer train ride takes you from Vancouver to Kamloops in style, letting you take in the incredible views along the way. Explore the full itinerary and details. From the Alaskan ice fields to the bright lights of New York City, the USA boasts an abundance of great attractions. You’ll find some of the most impressive, unique cities known to man: New England, Vegas, the east coast, Miami and, of course, the amazing west coast of America. If you’re thinking of visiting this wonderful continent, our land tours can give you access to all the best sights and experiences. Whether it’s a guided tour of Washington DC or a train journey across the vast Canadian expanses, we have something to suit everyone and every budget. South Africa is one of the world’s most exciting regions, with incredible safaris, a fascinating culture and natural beauty spots as far as the eye can see. With Cruise1st, you can experience it all. Our land tours can be booked along with our great cruise deals to give you the best experiences both on and off the ship. South Africa is home to Kruger National Park, one of the most famous safari parks in the world, with a range of wildlife exploration tours. As well as spotting the ‘big five’ on a classic safari, there are balloon rides, walking safaris and even helicopter tours. Alternatively, tours along the Garden Route – a long stretch of African coastline – are packed full of beautiful scenery and endless forests. In Cape Town, you can trek or take a cable car up Table Mountain for spectacular natural surroundings and even better views. From there, you will see the city’s beautiful beaches as well as Robben Island and the historic city centre. Packed full of significant monuments and intriguing museums, it’s worth setting a day aside just to explore Cape Town’s history. In the west, the modern city of Durban is yet another beautiful place to visit, with long beaches stretching out before the Indian Ocean. At Cruise1st, we’ve got some incredible deals on cruises to the Far East and China. From Hong Kong to the mountain-top tea fields of Japan all the way down to the picture-perfect beaches of Thailand, we have exclusive tour packages to every taste and budget. We’ve got a range of China land tour itineraries to choose from, including tours to meet the Terracotta Warriors and day trips to explore the Forbidden City. From the stunning scenery and lush vegetation of Wùyuán in Southeast China to the ancient statues and artworks of the 5th-century Yúngāng Caves, China is a magnificent country with hidden historic gems waiting to be discovered at every turn. A visit to the Far East wouldn’t be complete without a trip to the wealthy city-state of Singapore. Here you can shop until you drop in the bustling street markets and feed on a feast of fragrant regional cuisines. If you prefer a slower pace, the crystal-clear waters of Nha Trang Bay in Vietnam provide the perfect place to relax and unwind. Thinking of setting sail to visit Australia and New Zealand? Combine your cruise with one of our carefully selected land tours and discover even more of the awe-inspiring sights and sounds these incredible nations have to offer. From guided tours of Sydney’s most iconic landmarks to luxury cross-country train journeys, we have a land tour itinerary to suit every taste and budget. Our Australia and New Zealand land tours have been designed to help you make the most of your holiday. Do you want to explore the heart of Australia? Hop on board the mighty Indian Pacific sleeper train and embark upon an unforgettable 2,700-mile journey from Sydney to Perth via Adelaide. With big screen windows in every cabin allowing for an uninterrupted view of the majestic landscape of the outback and plenty of off-train activities to choose from, our land tours are a must for adventure-loving explorers of all ages. Without a doubt, South America is one of the most diverse continents in the world. From its wildlife to its culture, the likes of Brazil, Argentina and Chile give visitors plenty to take in. And, if you’re planning a South American cruise, our land tours are the best way to explore the continent in all its beauty. If it’s natural beauty you’re after, the likes of Brazil and Chile won’t disappoint. A tour to Brazil’s rainforests puts you at the heart of one of the world’s greatest nature reserves, while the Chilean fjords provide endless beauty to explore. And a tour to the Brazil-Argentina border lets you experience the incredible Iguazu Falls. Made up of 275 waterfalls, it’s the largest waterfall system on the planet. You can also visit Argentina’s Puerto Madryn for a truly spectacular array of wildlife, or Ushuaia, the southernmost town which provides a gateway to Antarctic expeditions. India is a remarkable land famed for its astounding architecture, colourful culture and sacred spiritual sites. From the tranquil turquoise waters of the Bay of Bengal – the largest bay in the world – to the romantic splendour of the magnificent forts and palaces of the Land of Kings, the wonders of India never cease. Our Taj and Tigers tour allows you to explore Mumbai, including the Shivaji Train Terminus and the open-air laundry of Dhobi Ghat. Next, you’ll take a ferry ride to Elephanta Islands and visit the famed Elephant Caves, a group of five Hindu caves. You will also have the chance to experience Delhi and the highlight of the trip would have to be a two-day stay at Ranthambhore Tiger Park, where you will enjoy an open-top Jeep safari. Experience the historic wonders of Egypt and Jordan like never before as part of a luxury escorted tour from Scenic. Bringing their signature all-inclusive service to the vibrant lands of northern Africa for the first time, Scenic invite you on the ultimate voyage of discovery, transporting you from Petra to the Pyramids in exceptional 5-star luxury.